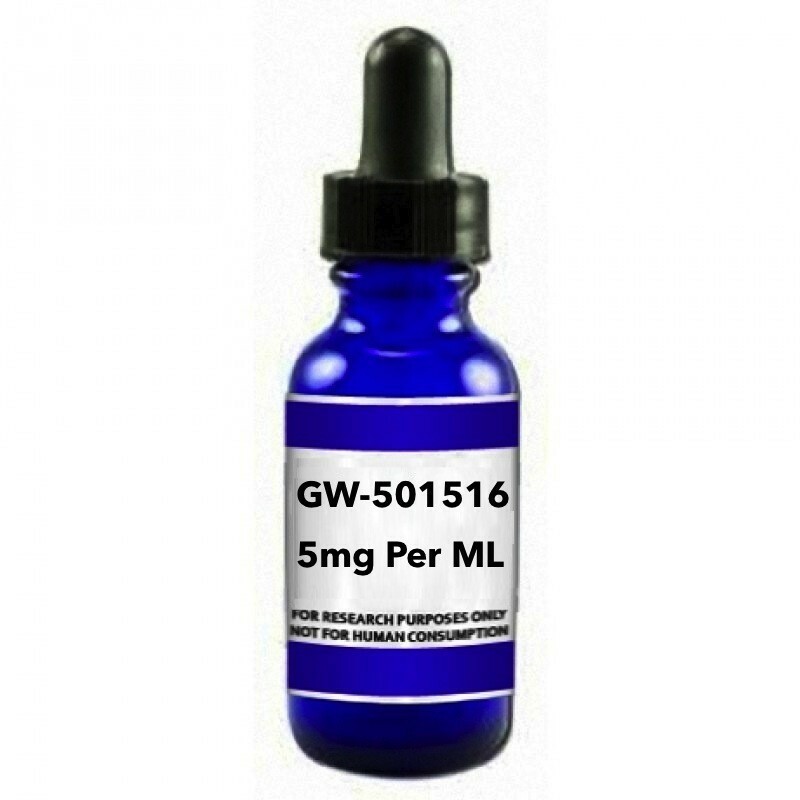 Buy GW-501516 5MG from GEO PEPTIDES with quick delivery and free shipping of GW-501516 5MG on orders over $150. GW-501516 5MG X 30ml GW-501516 (also known as GW-501,516,GW1516 or GSK-516) is a PPAR***948; modulator compound being investigated for drug use by GlaxoSmithKline. It activates the same pathways activated through exercise, including PPAR***948; and AMP-activated protein kinase. It is being investigated as a potential treatment for obesity, diabetes, dyslipidemia and cardiovascular disease. GW-501516 has a synergistic effect when combined with AICAR: the combination has been shown to significantly increase exercise endurance in animal studies more than either compound alone. GW-50156 regulates fat burning through a number of widespread mechanisms. it increases glucose uptake in skeletal muscle tissue and increases muscle gene expression, especially genes involved in preferential lipid utilization. This shift changes the body's metabolism to favor burning fat for energy instead of carbohydrates or muscle protein, potentially allowing clinical application for obese patients to lose fat effectively without experiencing muscle catabolism or the effects and satiety issues associated with low blood sugar. GW-501516 also increases muscle mass, which improved glucose tolerance and reduced fat mass accumulation even in mice fed a very high fat diet, suggesting that GW-501516 may have a protective effect against obesity. It has been demonstrated at oral doses of 5 mg a day to reverse metabolic abnormalities in obese men with pre-diabetic metabolic syndrome, most likely by stimulating fatty acid oxidation. Treatments with GW-501516 have been shown to increase HDL cholesterol by up to 79% in rhesus monkeys and the compound is now undergoing Phase II trials to improve HDL cholesterol in humans. Application: A selective and potent PPARB agonist CAS: 317318-70-0 Molecular Weight: 453.5 Molecular Formula: C21H18F3NO3S2 Appearance: Clear Storage: Room Temperature Buy GW-501516 5MG X 60ml WARNING This product is a very potent chemical. This product is NOT for human use and can be harmful if ingested. This product is for research/laboratory use only. This product is NOT in a sterile solution and is NOT to be injected. This product should only be handled by licensed, qualified professionals. This product is not a drug, food, or cosmetic and should not be misbranded, misused or mislabeled as a drug, food or cosmetic. The latter article is intended for educational / informational purposes only. THIS PRODUCT IS INTENDED AS A RESEARCH CHEMICAL ONLY. This designation allows the use of research chemicals strictly for in vitro testing and laboratory experimentation only. Bodily introduction of any kind into humans or animals is strictly forbidden by law.